The Flavor of the Old West encompassed in a rugged, secure, field holster. The Cattleman is the new and improved version of the Range Master mentioned on Gunblast.com. It offers almost the same full protection to your gun as the Sourdough, but in a more traditional format. This is probably a better option for thinner men and women rather than a large pancake holster. Whether you go to the range to practice and compete or ride the range for solitude and peace of mind, you will enjoy the Cattleman. This is a good holster for Cowboy Action Shooting. After using the older design for almost a year, we have found some short comings and addressed them here with this more traditional holster. It offers more protection for the gun, rides lower and has better eye appeal. A secure, high ride heavy duty holster; your gun is in position for a quick, smooth, draw and effortless holstering. We tested a half dozen of the Cattleman holster for 1911s and a HK VP9 at gunsite... simple and rugged, perfect for range and field use. Available with a hammer thong or a hammer strap, this holster is tightly molded to each model and barrel length for a great fit and retention. This has a fold over tunnel loop design that is snug and can be made for belts up to 2.5″ wide (standard is 1.75″). Available for most SA and DA revolvers as well as most popular models of auto loaders. 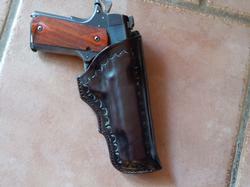 To view barrel measurement instructions and guns we can make this holster for click here to view gun chart. USE THE "ADDITIONAL GUN INFO" TEXT BOX TO TELL US YOUR EXACT GUN MODEL AND BARREL LENGTH. We also build this for the TRR8 and the Thunder Ranch 325. This is a great holster for women in the field, at the range, and concealed under a jacket or vest.